Torque Multiplier and Adaptor for the Ford ecoboost engine from Laser Tools. On the modern Ford 1L Ecoboost engine, if you have any reason to access the front of the engine – perhaps to remove the pulley, or when repairing or servicing the timing belt or front main seal – you need to remove the very tight pulley securing bolt. A torque multiplier is needed for this, to both undo, and then upon reassembly, retighten the bolt. 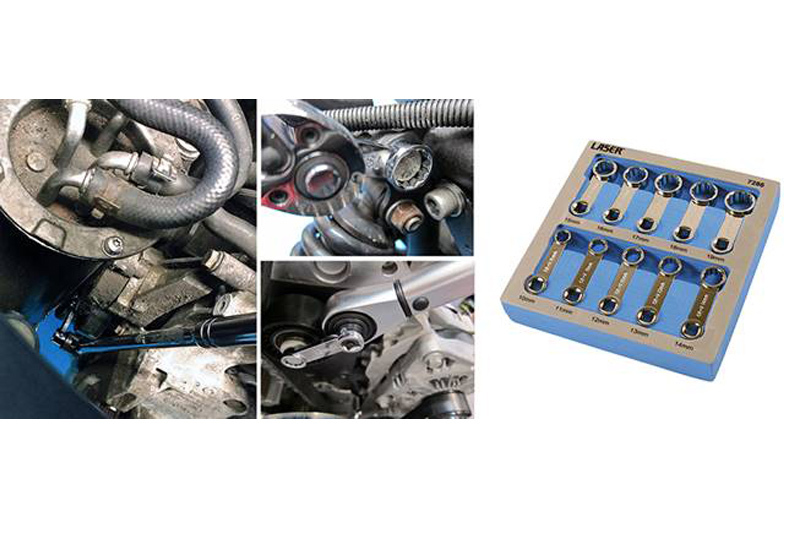 LASER TOOLS provides the torque multiplier (part number 7318) and the special adaptor kit (part number 7317) that enables it to be used on the 1L Ecoboost engine. The company says it makes it a very straightforward job: once the engine flywheel has been locked (locking tool in timing tool kit 6952), the right-hand driveshaft bracket is removed and the main bracket and fittings from the adaptor kit are bolted onto the engine. The torque multiplier is now fitted and turned with a 1/2″ drive bar or ratchet. The 9:1 ratio of the torque multiplier makes removing the extremely tight securing bolt an easy task. The same set-up is used when refitting and tightening (it’s a stretch-bolt, so make sure you fit a new one). The tightening sequence includes the use of a torque wrench, then the torque multiplier. Full instructions are supplied with the 7317 adaptor kit. The 7318 torque multiplier has a 1/2″ drive input and 3/4″ drive output; the maximum output torque figure is 1500Nm. It is geared at 9:1 with a torque ratio of 1:6.5. The 7317 is suitable for the 1L Ecoboost with following engine codes: M1JA, M1JE, M1JH, SFJA, SFJB, SFJC, SFJD, M1DA, M2DA, M1DD, M2DC, M1JC, M1JJ, P4JA, P4JB, P4JC, P4JD, XMJA, XMJB, XMJC, XMJD, YYJA, YYJB, M2DB, SFDB, M2GA, M2GB, M1CA, M1CB, SFCA, SFCB, SFCC and SFCD. Equivalent to the Ford OEM tools 303-1611-01 and 303-1611-02.